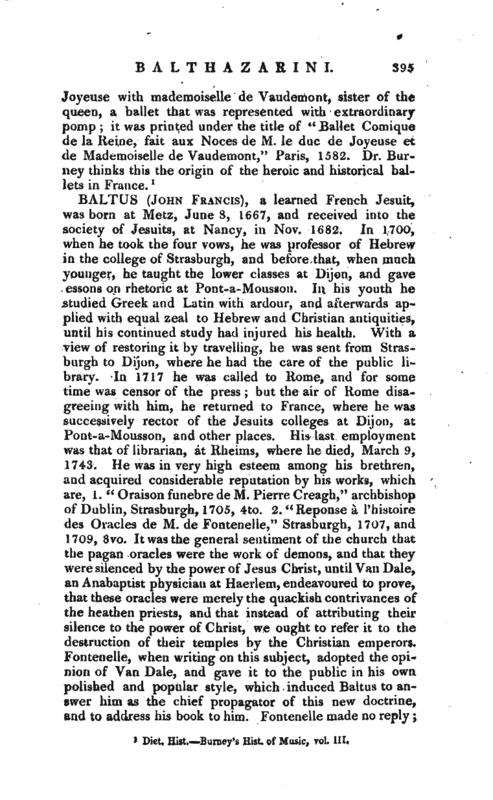 , a learned French writer, was born in 1631, at Tulles, in the province of Guienne, where he began his education, and finished it at Toulouse, obtaining a scholarship in the college of St. Martial. In | 1656, Peter de Marca, archbishop of Toulouse, invited him to Paris, which he accepted, and in a little time gained the esteem and entire ron-adence of this prelate. But upon his death, in June 1662, Baluze, looking out for another patron, was agreeably prevented by M. le Tellier, afterwards chancellor of France, who having an intention to engage him in the service of abbe le Tellier his son, afterwards archbishop of Rheims, made him several considerable presents. Some obstacles, however, having happened to prevent his continuance in this family, and Mr. Colbert having offered to make Baluze his library-keeper, he accepted the office with the consent of M. le Tellier. 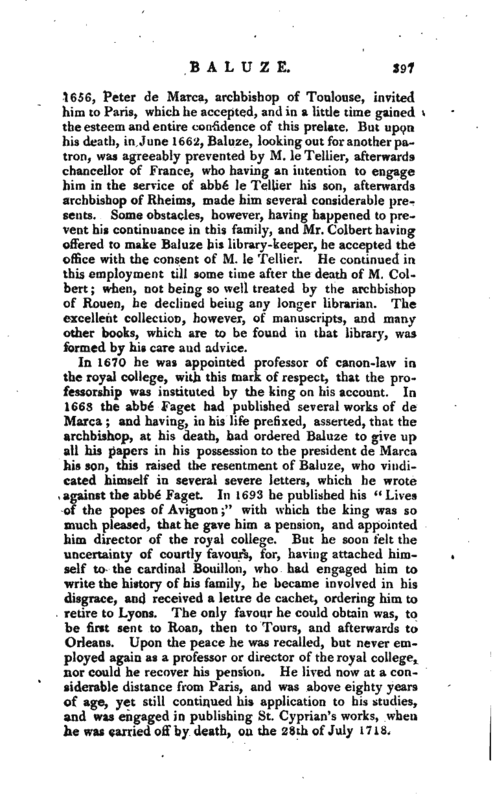 He continued in, this employment till some time after the death of M. Colbert when, not being so well treated by the archbishop of Rouen, he declined being any longer librarian. The excellent collection, however, of manuscripts, and many other books, which are to be found in that library, was formed by his care and advice. In 1670 he was appointed professor of canon-law in the royal college, with this mark of respect, that the professorship was instituted by the king on his account. In 1668 the abbé Faget had published several works of cle Marca and having, in his life prefixed, asserted, that the archbishop, at his death, had ordered Baluze to give up all his papers in his possession to the president de Marca his son, this raised the resentment of Baluze, who vindicated himself in several severe letters, which he wrote against the abbe“Faget. 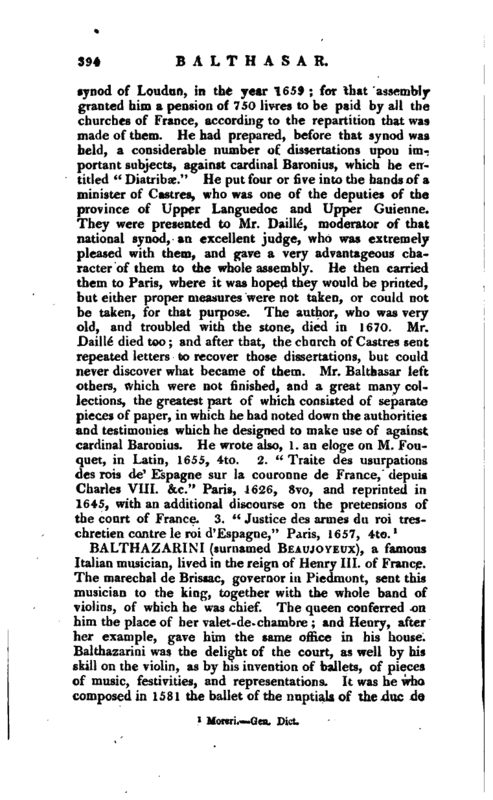 In 1693 he published his” Lives of the popes of Avignon" with which the king was so much pleased, that he gave him a pension, and appointed him director of the royal college. But he soon felt the uncertainty of courtly favours, for, having attached himself to the cardinal Bouillon, who had engaged him to write the history of his family, he became involved in his disgrace, and received a lettre de cachet, ordering him to retire to Lyons. The only favour he could obtain was, to be first sent to Roan, then to Tours, and afterwards to Orleans. Upon the peace he was recalled, but never employed again as a professor or director of the royal college, nor could he recover his pension. 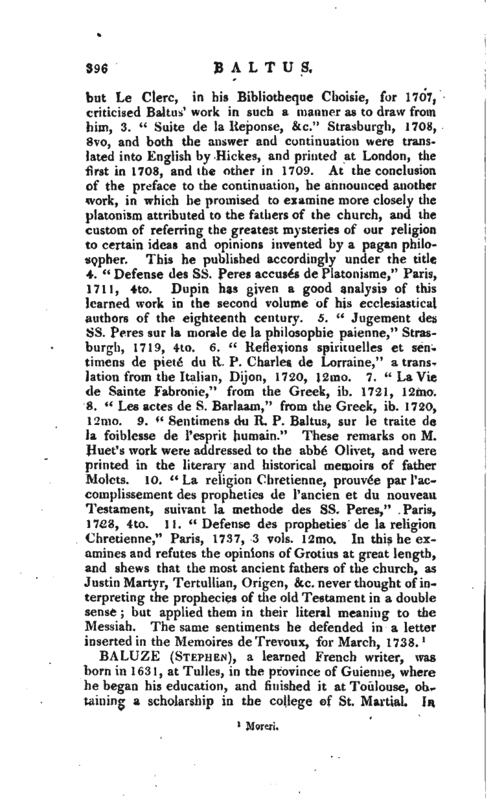 He lived now at a considerable distance from Paris, and was above eighty years of age, yet still continued his application to his studies, and was engaged in publishing St. Cyprian’s works, when he was carried off by death, on the 28th of July 1718. | Baluze is to be ranked among those benefactors to literature who have employed their time and knowledge in collecting from all parts ancient manuscripts, and illustrating them with notes. He was extremely versed in this species of learning, and was perfectly acquainted with profane as well as ecclesiastical history, and the canon Jaw, both ancient and modern. He kept a correspondence v.ith all the men of learning in France, and other countries. His conversation was easy and agreeable, and even in his old age he retained great vivacity. He shewed, however, somewhat of caprice in his last will, by appointing n woman, no way related to him, his sole legatee, and leaving nothing to his family and servants. 1692, 8vo. 10. “Epistoloe Innocentii III. Liber XL” ib. 1682, 2 vols. fol. not a complete collection, as Baluze was refused the use of those preserved in the Vatican. 11.“Nova Collectio Conciliorum,” ib. 1683, fol. containing such pieces as are wanting or imperfect in Labbe’s collection. 12. 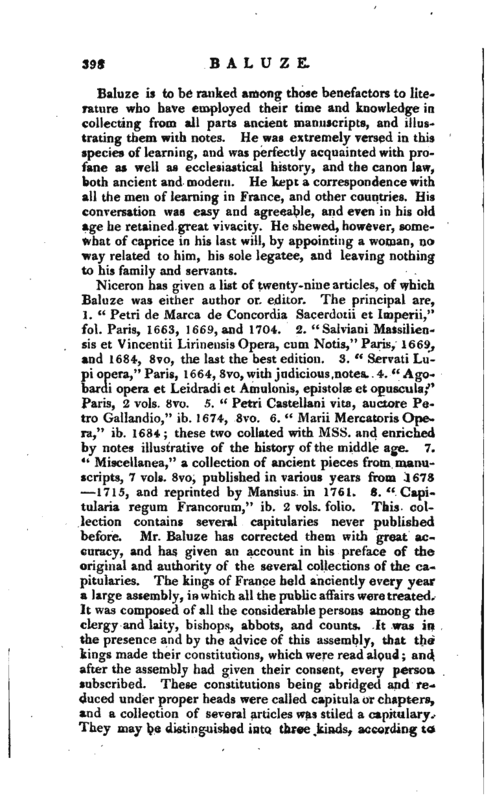 “Vitae Paparum Avenionsium,” mentioned before, ib.